Talent from toddler to teens! I’m so used to seeing these actors playing child versions of adults in my favorite dramas. However, these youngins’ are grown up fast and are now leading men and women in their own dramas! Here are 5 of my favorite child actors that have matured into amazing young adults (teens). Yeo Jin Gu (18yrs) – Uniquely known by his mature deep voice paired to such a young age and face, he started acting back in 2005. He is commonly paired with Kim Yoo Jung as a child actor for saquek dramas. Furthermore, at such a young age, he has played many difficult roles that require heavy angsting and crying. He has become such a master at these broody roles and has progressed to lead roles now as a young adult. Most memorable performances for me are in The Moon Embraces Sun and I Miss You as the childhood version of the adults and Hwayi, the movie, as a lead role. It’s been a slow drama start for 2016. I didn’t have high expectations for any shows. Well that was until Morrasoom Sawad! So in love with the Weir-Preaw pairing. Kwang is the daughter of a wealthy aristocrat. Her family tries to keep it together but truly everything is falling apart. Her father had several wives/mistresses resulting in five kids, including Kwan and her sister Wor who share the same mother. There is also Nop – no one knows who his mother is – and two younger siblings from a relationship between the father and a maid. No need to say that the maid has long been upgraded to the status of legitimate wife. In addition to the tension that rises because of who is a legitimate child vs. who is not, Kwang’s father has been wasting money like no other by spoiling his kids left and right, contracting debts, pawning his belongings, and investing in useless businesses. To be honest, I came into Moorim School with pretty low expectations. While I do enjoy my “school” dramas, the premise didn’t sound too enticing. I am pleasantly surprised by how much I am looking forward to this bag of mixed tricks. 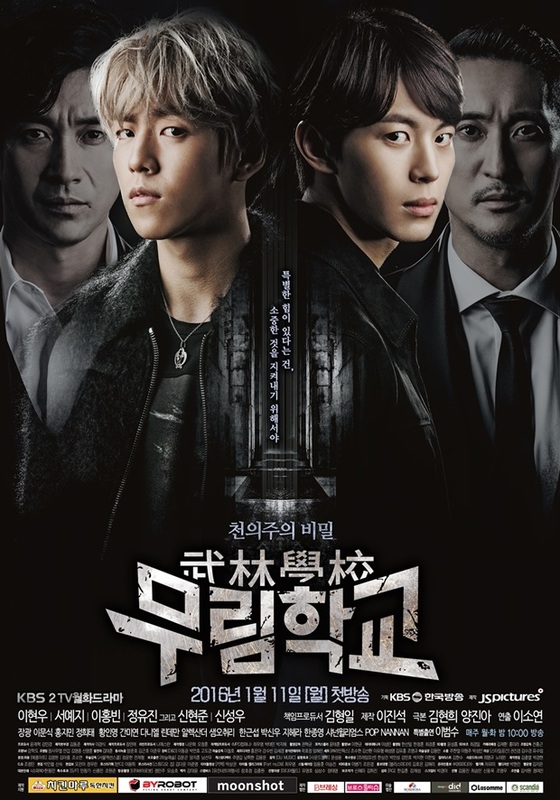 Moorim School follows students from different walks of life who end up at this special institute where academics are taught in addition to martial arts (and supernatural abilities). We are introduced to Shi-Woo, top kpop idol star, who is starting to have hearing problems that he can’t find a cause for. These episodes of ringing in his ears are debilitating and pain for him. During one of his concerts, the overhead lights malfunctioned and started to drop. However, somehow he was able to slow the dropping through a possibly mystical force that he possessed. In this confusion, Sun-A, a girl who goes to Moorim School and admires Shi-Woo manages to save him from being crushed and tells him to go find her school. While Shi-Woo’s company tries to cut Shi Woo out because of his disability, Soon-Duk (another student of Moorim), manages to entangle herself in a scandal misunderstanding. This scandal brings down Shi-Woo’s career as a singer completely. Our third main player, Chi-Ang, a young chaebol (out of wedlock) coming from China is forced to go Moorim as he had dropped out of 22 other institutes. He butts heads with Shi-Woo on his first day back as his father is the one sponsoring the concert. They are both arrogant and hate each other on site. On his way to the school, he tries to run away and manages to almost drown himself. Soon-Duk manages to save him as well and he becomes infatuated with her. Somehow as Shi-Woo and Chi-Ang again cross paths on their way to the institute, their playground brawl sends them tumbling into a seal that had kept the school hidden. One or both of them were able to unlock the seal which garners the interest of the professors at the school. However, both of these new student have a hard time adjusting to their new environment. Which of course, ultimately ending in another brawl with a surprising showcase of their own hidden martial arts skills. Even though I really want to continue the drama, the director has to figure out where he wants to go with it. I am feeling a mixed bag of thriller, mystery, supernatural, and romcom! It feels like each character is playing in a different series right now. With Soon-Duk doing some slapstick, Chi-Ang featuring in a romcom, and Shi-Woo angsting away. Counter this all with everyone being a school drama piece. I know we are only two episodes in so hopefully the director will find some stable ground soon. What really drew me in was that nicely choreographed fight scene at the end of episode two! How mysterious that both of them are already so versed in martial arts! Their past also seem to be entangled as with their future. When I think about the potential of this show and what it ended up being, my eyes get sore and I get a headache. The story started out great: angsty, great character development and a significant amount of scenes between our main leads. But then the director decided to give too much screen time to supporting characters and side drama. That’s when the show started hitting the fan. I didn’t quite understand when the male lead fell in love with the female lead with so little scenes between them [and so much hate between them] and how they MIRACULOUSLY ended up being together at the end. I am even more disappointed because I know both main actors are super talented. I hope next time they reunite for a drama they’ll give a good talk to the director and tell him not to ruin it… Please. A drama with good visuals, including great outfits but seriously nothing more. I feel like once in a while DramaLand puts on a pretty drama with gorgeous actors, but little substance. This is one of the best exampleS in my opinion. I could never get into this show no matter how many times I tried. My brain and my heart just wouldn’t cooperate. As it is the first drama of 2016 for me, I hoped to get off to a good start this year. I had some expectations due to the hype of this webtoon and my love for the actor, Park Hae Jin. Luckily, I am pleased to see how Cheese in the Trap is shaping out. The story tells of a young girl, Hong Seol, who at first glance seems like a Candy, but isn’t quite. She is from a poor family background and of course works multiple jobs to pay for tuition at her university. She does have that diligent attitude like most main leads, but also has a frightening colder side on rare occasion. At university, she happens to cross paths with Yoo Jung, a seemingly perfect sunbae who is smart, friendly, and handsome. However, interestingly enough, he has a very manipulative and dark side. He enjoys getting his way, not by dirtying his own hands, but by subtly forcing others to match his agenda. Hong Seol sees through his kind facade and he seems intrigued by how much she dislikes him. However, Yoo Jung is persistent about figuring out Hong Seol and worms himself into her life. She grudgingly becomes closer to him and they even start to date. Meanwhile, a rebel like young man, Baek In-Ho, manages insert himself into her life as well through several coincidences. They establish a friendly rapport and even bicker! However, Baek In-Ho seems to have a dark history with Yoo Jung. While their history hasn’t come into clear focus yet, it seems that Yoon Jung had something to do with Baek In-Ho breaking his piano-playing hands. However, it does seem to be more than that since In-Ho’s family seem to be living off of Yoo Jung’s chaebol household’s money as well. Yoo Jung is not quite a likable character as he becomes disturbingly cold and double-edged at times, to the point where you start to think if he has any real emotions at all. 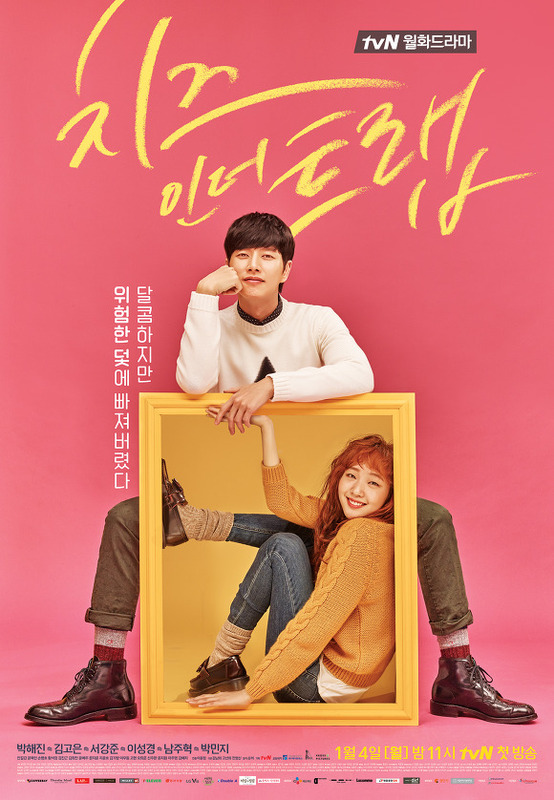 Through the many teasers before the premier, I had pegged Cheese in the Trap as a rom-com. However, its darker half has got me interested. Park Hae Jin seems to be drawing on his Bad Guys role at times and becomes very cold/frightening at times to the point where you think he might have actually killed a guy in his past. He has that way of intensely staring and that cruel smirk which makes me wonder if Hong Seol will get seriously hurt if she is in his way. Meanwhile Hong Seol is pretty relatable and I enjoy how the whole story is told through her point of view. We hear her thoughts in addition to the actual dialogue. I am definitely looking forward to how this story is going to pan out (though I can already feel that my heart is going to break for rebel In Ho!). Year End Special: Let’s Go to School! High school/college could have been the times of our lives or the depths of hell. Now that I am finally finished with both, it’s an odd feeling to be reminiscing about those experiences. This year brought a barrage of school related dramas and whole bunch of feels. Just how I like them. Geography Class: School 2015: Who Are You? Part of the famous “School” series, “2015” tries out the long lost twin sister game. Separated by just a few towns over, these girls encounter countless obstacles preventing their reconciliation. However, they have one common factor, a villainous bully who can’t wait to wrap her arms around both girls’ necks. This bully who seem to have no morals and that we would love to see her eyes get poked out. Lukily, we get to see an awesome transformation from a once meek twin to one who’s heart seems to be made of ice. Well, revenge is always best served cold…with a warm Sungjae smile on the side! Whispers: and let’s all agree that the writers messed up the ending when the OTP proportions were already on point for 15/16 episodes.